Size: 4.9" x 4.2" x 0.9"
Production of the TI-508 and its twin TI-1795 was shifted in 1991 from Taiwan to Thailand. The leading "C" in the Date code reveals Cal-Comp Electronics as manufacturer of these small dektop calculators. Dismantling this TI-508 manufactured in July 1992 reveals no surprises, the printed circuit board (PCB) is centered around a Sharp LI3135MR single-chip calculator circuit known already from the TI-502. 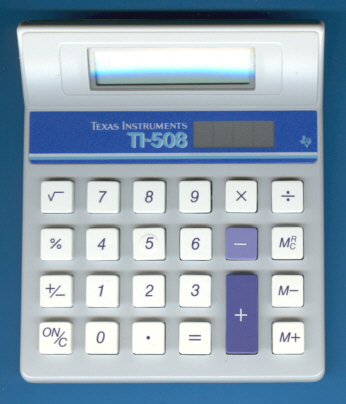 Within a few month the TI-508 PLUS replaced the TI-508.